In the memoir, Solnit delves into stories seemingly distant from her own life. I keep returning to an early passage on her mother; in fact, the first time I read it, I photographed the page and sent it to a patient friend, “Sometimes it’s valuable to return to the circumstances of childhood with an adult’s resources and insights, and that time around I realized I could not feel at all. Not for her, or for myself, except a dim horror, as if from a long way away. I had returned to the state in which I had spent my childhood, frozen, in suspended animation, waiting to thaw out, to wake up, to live.” For Solnit, the near is perilous and in order to cope, she reaches for the far. She can say more in telling stories about Frankenstein and Che Guevara than directly about herself. 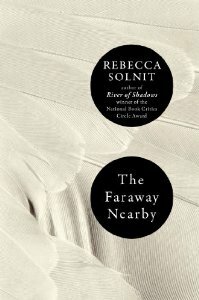 Of this title Solnit writes, “It was a way to measure physical and psychic geography together,” and it is this distance she tries to chart in the memoir. She is reticent to give the particulars of her experiences, begging that they no longer interested her. She instead meditates on meanings and in this she reminds me of Clarice Lispector. Lispector’s stories are outlines on which her philosophical meditations hinge; The Passion According to G.H. is on the existential crisis of a woman who kills a cockroach. In Lispector’s work, the material world is stripped away, leaving the observations of the soul; Solnit on the other hand grounds her ruminations in the sensuality of place. The subject of place has long obsessed Solnit. Her 1994 Savage Dreams ties the shadow histories of the Nevada Test Site and Yosemite National Park into the ongoing landscape wars of the American West, reading them as America’s Eden and Armageddon, bookends to the conquest of the West. In subsequent books, she has tackled, among other things, a history of walking, the landscape photography of Eadweard Muybridge, and the gentrification of her native San Francisco during the dot-com boom. Her writing is often described as peripatetic: she travels not just through places but also the imagination, makes surprising leaps and connections, and returns with the unexpected conclusions. This leap into the distance becomes literal when Solnit receives an invitation to be a writer-in-residence at Iceland’s Library of Water. The offer comes when the situation with her mother is at its worst, she has just ended a relationship, in part over her mother, and a routine medical checkup reveals a precancerous growth. The door to Iceland is one she made herself; a young man, shortly before he passes from leukemia, buys one of her books for his first love, who in turn gives it to her own mother. The two women travel to San Francisco for the opening of a friend’s art exhibit, where Solnit meets them and tells of her yearning to visit the far north. Early on, Solnit tells the story of Scheherazade in The Thousand and One Nights. The sultan, enraged that his queen had been unfaithful, decides to sleep with a virgin every night and slay her in the morning. Scheherazade spins a web of stories to keep the sultan in suspense from night to night. Towards the end, Solnit tells the story of Ashley Smith. A fugitive with a history of violence takes her hostage in her house, and in order to appeal to his empathy and stave off his murderous rage, she tells him stories of her dead husband, her drug addiction, and her young child. In the face of crisis, Solnit also weaves stories to find her way out, and in doing so, she shows us how we undo and recreate ourselves.